Wonder Crew Is Here To Save The Day! Traditional gender lines in the toy business are evolving. This is more a case of the business recognizing reality than it is of any great change in the make-up of how kids play with toys. There have always been times when boys would want to use play to explore more emotional and nuturing behaviors, like with dolls or creative activities, and there have always been times when girls wanted more action and adventure, with action figures, sports or play weaponry. It’s only been recently that society has recognized the folly of forcing kids to play within strictly-defined traditional gender roles. In the past few years we’ve seen a range of Nerf foam play weapons for girls, and last year we saw the rise of two action figure lines aimed at girls, IAmElemental and DC Superhero Girls. We have also seen Hasbro release their Easy Bake Oven in gender-neutral colors so that boys can learn the basics of cooking. The marketing of toys has caught up with reality as traditional gender-defined roles have evaporated. The end result of this is a better choice of toys for all kids. In that spirit, Laurel Wider, a psychotherapist and mom, developed Wonder Crew. 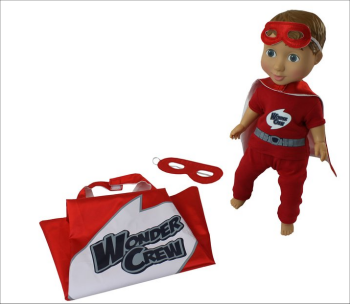 Wonder Crew is a hybrid doll/action figure, intended for boys, but also fun for girls, that allows kids to figure out their own play patterns. Wilder was shocked when her son came home from preschool one day and announced that “Boys aren’t supposed to cry.” Frustrated by many of the messages boys were (and weren’t) receiving from the “blue aisle” and inspired by the way play influences child development, Laurel created Wonder Crew to encourage kids to be their full selves. Originally launched as a Kickstarter project in 2015, Wonder Crew has been picked up for national distribution by Playmonster, and can now be found at Target and several independent toy retailers. They will also soon be available again directly from the Wonder Crew website. 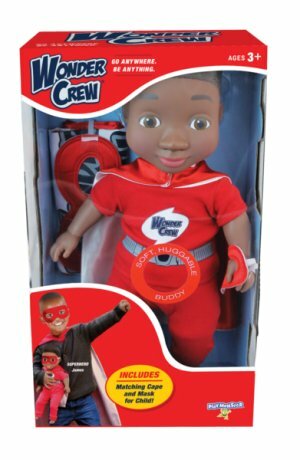 There are four different versions of the original Wonder Crew doll, “Superhero Will” (Caucasian),”Superhero Erik (Asian), “Superhero James” (African-American, seen right) and “Superhero Marco (Hispanic). The dolls are identical, save for their ethnicities. Extra outfits, allowing the dolls to become construction workers, explorers and more are coming soon (seen below). Wonder Crew combines the emotional attachment that a child has to a doll with the sense of adventure that kids get with action figures. In essence, this is the best of both worlds. Plus it offers an additional bit of role play fun. 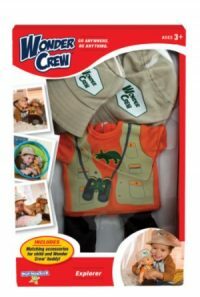 Included with each Crewmate is a child-sized matching-piece of adventure gear. When children suit up alongside their Crewmate, this not only adds to the crew-like vibe, but also deepens the imaginative play experience. 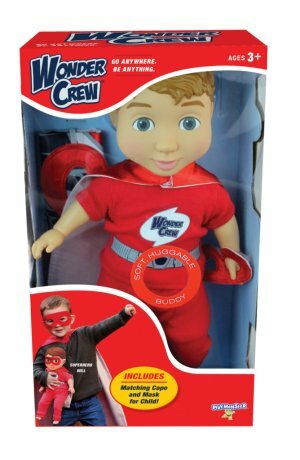 Wonder Crew is aimed at kids ages three and up. The target audience would probably be in the three to seven-year-old range, which is the perfect age for fostering imagination through play. A large part of the appeal of Wonder Crew is that it encourages kids to make up their own storylines and figure out how they want to play for themselves. This is a nice counter to all the strictly-defined toys based on licensed properties. With such a great idea behind it, how are the toys? These are solidly-made toys, built to withstand the rigors of playing with an active three-year-old. 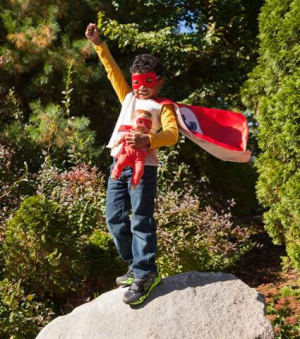 Made like a traditional baby-doll, with a plush body and plastic head, hands and feet, the dolls come with removeable superhero outfits–a cape attached with velcro, a mask held on with an elastic band, plus shirt and pants. The cloth items are very well-made, and the doll is more than up to snuff, with a sharp headsculpt that kids will love. The dolls are around 16 inches tall, which makes them perfect for smaller hands, and with their soft body, they’re also great for snuggling. I can see these finding a life on the secondary market as adult collectibles in a decade or so, when the kids who grow up with them get hit with the nostalgia bug. Wonder Crew has all the makings of an evergreen toy, one that will appeal to multiple generations. It was a bit of savvy marketing to make the initial doll a superhero. Kids (and adults) love superheroes now. We are in the midst of a superhero boom the likes of which has not been seen since the mid-1960s. Not only are the Marvel and DC heroes among the most popular toys with kids these days, we also have newer properties like PJ Mask, Paw Patrol and others that show the appeal of this type of fantasy to children. The bonus with Wonder Crew is that kids get to make up their own stories, and with the accessory packs on the way, they’ll be able to take their imaginations in new and exciting directions. Wonder Crew is a definite winner, and will likely make a big splash at the International Toy Fair in New York next month. My grandson loves and sleeps with his favorite toy.What a great idea.